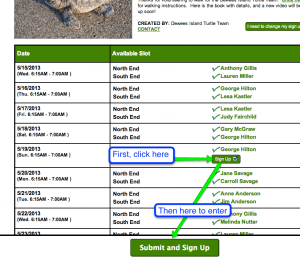 This is the home page for the Dewees Island 2016 Turtle Team. We’ll try to keep it updated, but it’s hard to leave the beach to sit at the computer. 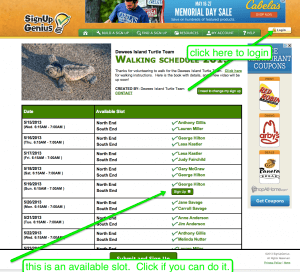 For the most recent loggerhead turtle activities, click our nestlog page. This year, we are using sign up genius to keep the schedule. 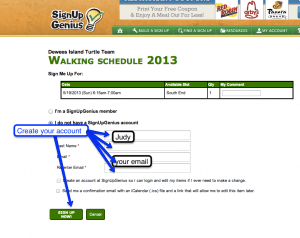 All community members and renters are welcome to walk with the Dewees Island turtle team. If you have never walked before, please watch our training video, and go the first time with a repeat walker. Our island interns have turtle walk programs each Wednesday and Thursday, leaving from Osprey Walk. If you are a renter, you are also welcome to join them: you’ll be sure to learn a lot. Each walker also needs to have a signed Turtle Volunteer Agreement (click to download a PDF version of the form). Please remember to call or text Gary on his cell phone whenever you’re done to let us know that you have finished your walk. Dewees Island: Walking for the Turtle Team from BluePixy on Vimeo. Now choose a slot that’s available and click it. You’ll create an account for yourself. Now the system will remind you when it’s your day to walk, and you are all set. Dewees Island Loggerhead Hatchlings from BluePixy on Vimeo.